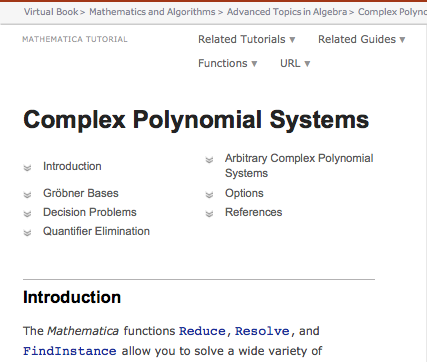 At the top of the Complex Polynomial Systems page in the Wolfram Documentation Center, there is a table of contents with each item linking to the appropriate headers below (Mathematica 9 and above). How do I create this style of table of contents in Wolfram Workbench for my own tutorials? I am using Workbench 2.0. A solution that requires Workbench 3.0 is acceptable. The table of contents is generated automatically by Workbench 3.0, which you need to request from Wolfram because it hasn't been officially released. Workbench will generate a link for each "Section" cell that you include in your tutorial. Edit: If you have Workbench 3 but don't want to use it directly, you can load the DocumentationBuild package that comes with it and run the ConvertNotebook function on an authoring notebook created using the DocumentationTools palette. How to get complete Documentation Center graph of guide pages? How to write documentation in Wolfram Style? How to disable opening new Documentation Window when selecting an item from the Documentation Home page?